All over the world, people are losing night. In fact, 80% of the global population cannot see the Milky Way from where they live. How can this be? The answer is light pollution. Light pollution occurs when poorly planned artificial lighting shines up and out into the night sky, rather than directed down toward the ground. Brightly and inefficiently lit billboards, sports fields, street lamps, front porch lights, and much more contribute to the light that prevents us from seeing a brilliant night sky. But there’s more at stake here than just our ability to see the stars. Several different bird species use moonlight and starlight to navigate their migration routes. Artificial lights provide a deadly road block, as they are continuously attracted to bright city lights, become disoriented, and fall to their deaths. Moths, who are essential pollinators in our ecosystems, are attracted to artificial light as well. As they flutter around our lights, they are easily picked off by predators, or become so confused they continue to hover around the light until they can no longer fly. 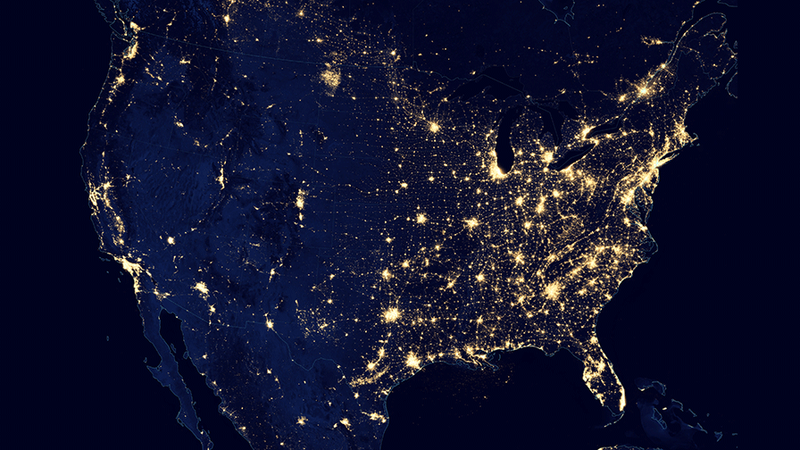 Even human health is impacted by light pollution. The 2017 Nobel Prize in Medicine was awarded to three researchers who identified the mechanism of the circadian rhythm at the genetic level. Circadian rhythms are biological clocks that tell our bodies when to rest and when to wake. These natural sleep-aids are disrupted by the use of artificial light and have detrimental effects on sleeping patterns. Light pollution has consequences that many of us may not be aware of, which is why it is important for us to recognize the importance of the night. Night is an experience shared by almost all living things. It is a biological and cultural pillar of life on earth. What would happen if we could no longer experience night? On the positive side, light pollution is one of the only forms of pollution that is reversible. There are easy actions you can take to spark change: use light only when and where needed, use fixtures that direct light downward, and use warm-toned LEDs rather than high-energy blue-toned LEDs. Simple changes make a big difference. We are losing the night, but we can bring it back one dark-sky-friendly lightbulb at a time. Western Slope Skies is produced by members of the Black Canyon Astronomical Society. This episode was written and recorded by Park Ranger Julianne Renner of Black Canyon of the Gunnison National Park.